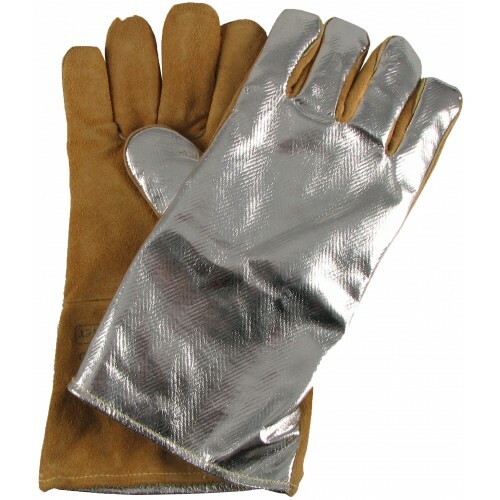 Welding gauntlets with aluminized back which reflects 95 percent radiant heat, deerskin inner layer for better dexterity, comoflex lined palm and back for sweat and heat absorption. Kevlar swtiched for extra durability. Size large. CE approved and conforms to EN12477. This standard describes how the gloves are designed to provide protection for both hand and wrist while welding or simular work, this is a combination from testing EN 388 and EN 407. Welding gloves shall provide resistance to small splashes of molten metal, short exposure to convective heat, to radiant heat and to contact heat. The welding gloves shall give protection from mechanical risks as well.